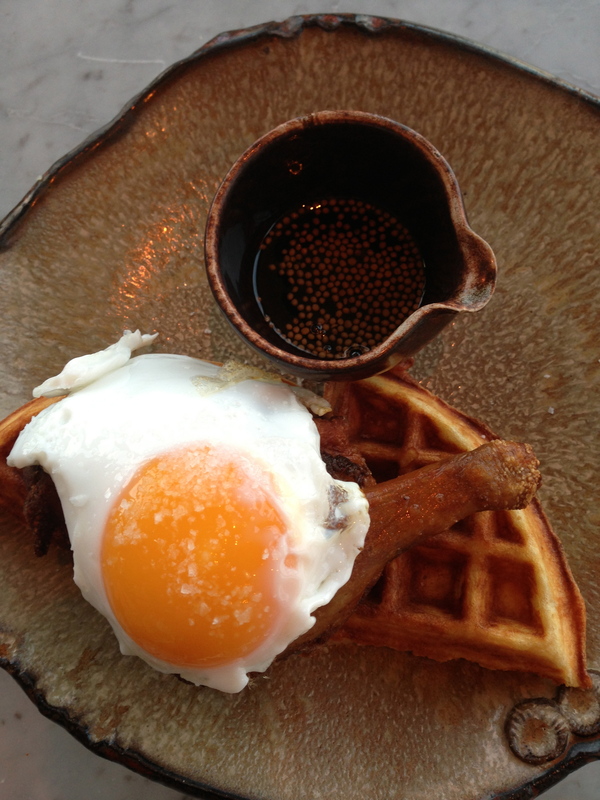 Home » ★★★★☆ » Duck & Waffle. The Sequel. Duck & Waffle. The Sequel. I had been here for breakfast with the old man on a weekend. Mid-morning, on a Sunday, it was fairly sedate and half-empty and those regulars who might be found here of an evening were probably still nursing their hangovers. It was a different restaurant altogether when I got there on a Thursday night, with food genius M and food-obsessive B, on the last lap of the longest leaving do in history, eating his way round London before returning to the land of Oz. If you have vertigo, I suggest you keep your eyes shut when going up the Heron Tower, in the glass lift, otherwise your appetite may disappear, as your stomach hits the floor. Forty floors up, this is, without a doubt, one of the best views in London. Certainly one of the best with food. Naturally, M knew the chef (I have yet to discover a chef she doesn’t already know) so we got the best seat in the house: a curved banquette, facing THE VIEW. Because it is all about the view up here, and the view is utterly breathtaking. And not only that, before we ordered, some unbidden extras. 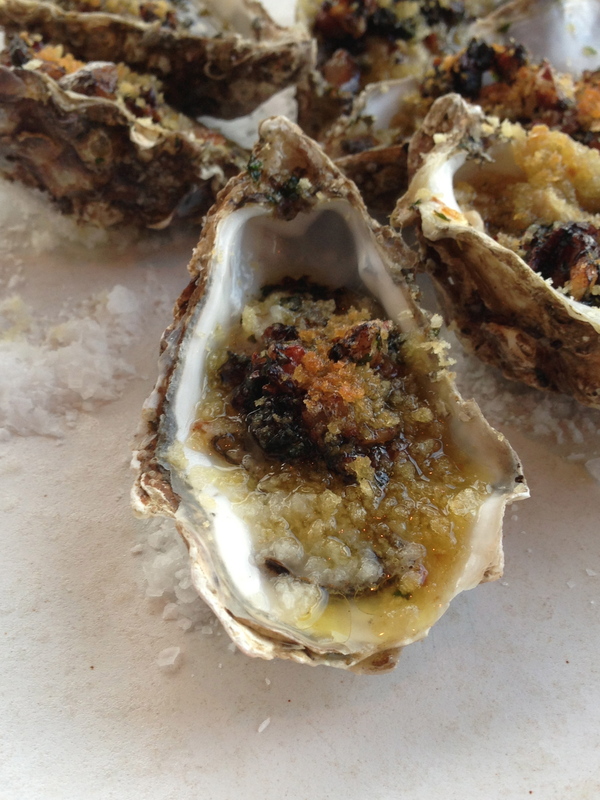 Grilled oysters with lemon and Parmesan crust – wonderful. 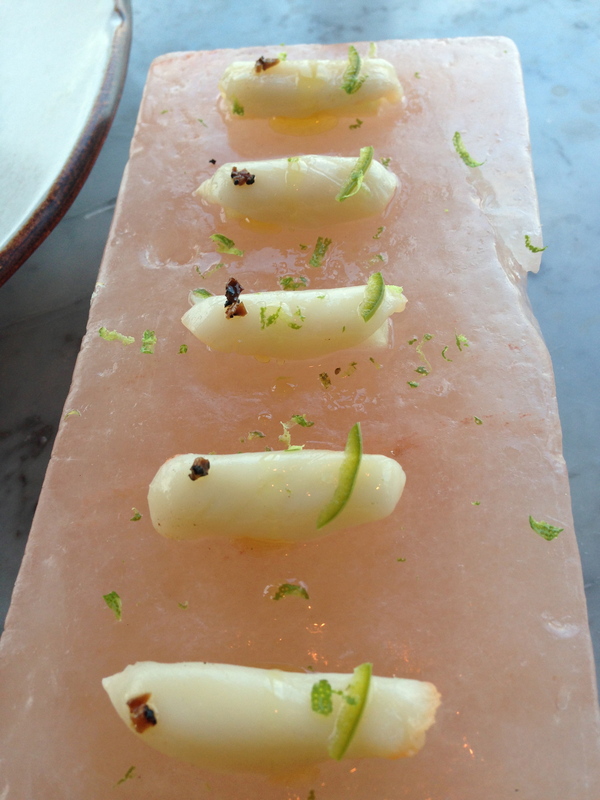 And then raw scallops, on a life-sized brick of pink Himalayan salt. Who knew? As it happens, M, and I felt food-inadequate. Not for the first time. I could taste apple, but don’t recall the black truffle and lime mentioned on the menu. And, being the control freak that we all know that I am, I did something entirely out of character. I agreed to let M order. And it was very interesting too, because I didn’t know what was in each dish until I read the menu properly, later that evening. And so it started. First up, a salad of smoked cow ricotta, with pea shoots and what seemed like a balsamic vinegar. I’m reading granola, sage, honey and Amalfi lemon on the menu, but I wasn’t really aware of all that when I was eating it. I’m not madly keen on smoked cheeses, but this was interesting. Then a drama dish. Another block of salt, and on top, a glass jar, containing what appeared to be only smoke. But no, there were three pieces of salmon concealed beneath. A bit of theatre, on the table. And delicious. 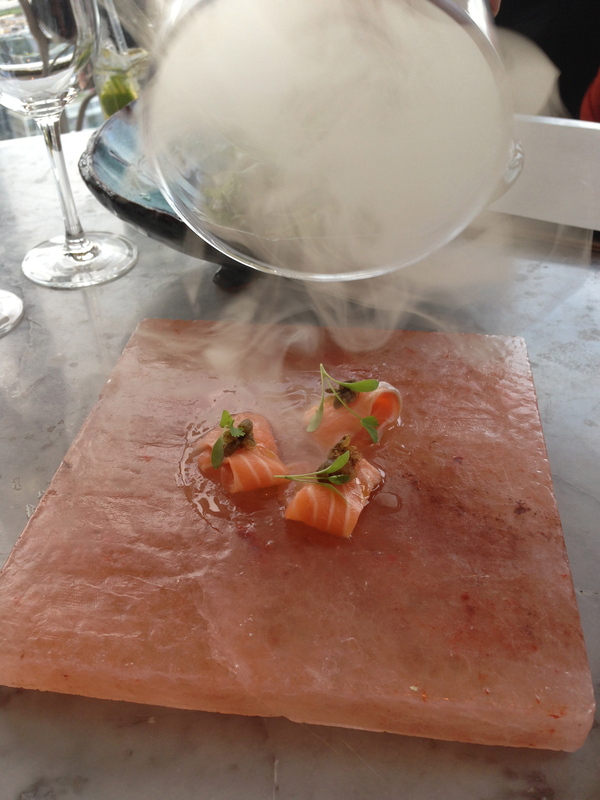 Sharp smokiness and ultra fresh salmon. 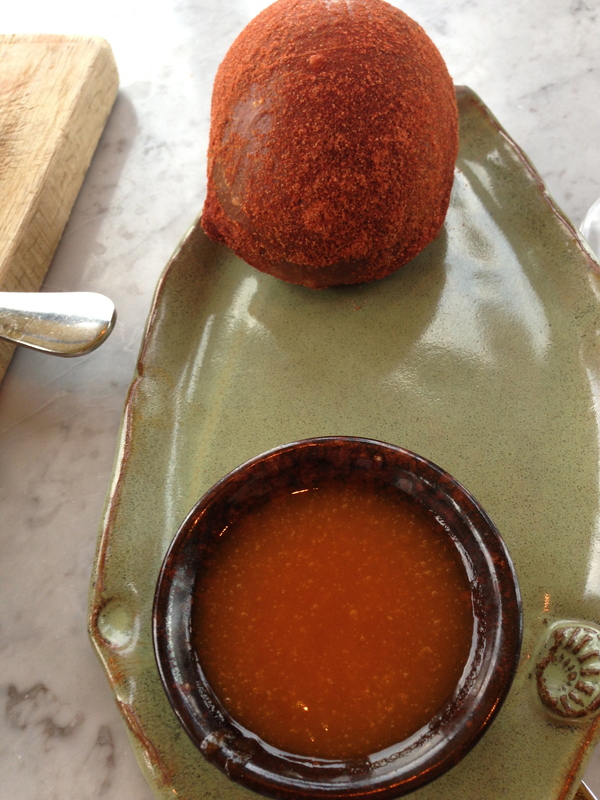 And then a large ball, the size of an orange and covered in paprika, with a small side dish of sweet sauce. Turns out it was apricot jam. I’m not sure I’d have guessed that. 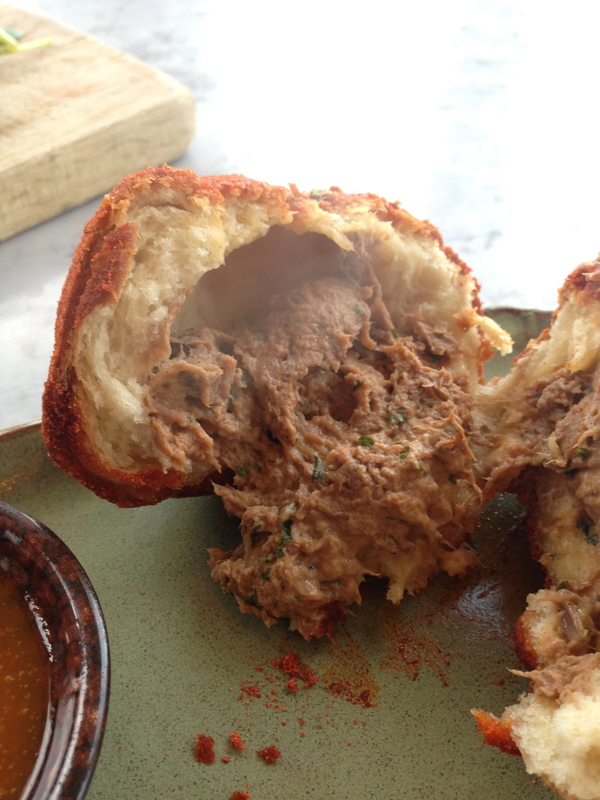 This was, an ox-cheek filled doughnut, not that you could tell from the outside, to be dipped in the sweet sauce-now-revealed-to-be-jam . Sweet and savoury seem to be the order of the day here and appear in many dishes. The doughnut was a little doughy (well, it was) and the ox-cheek needed a bit more oomph to be interesting, but again, it was fun to try to guess what it was and seemed to me to be a western version of those delicious dim sum with the very pale exterior and the rich sweet-and-sour mix of pork, onion and sweet sauce within. 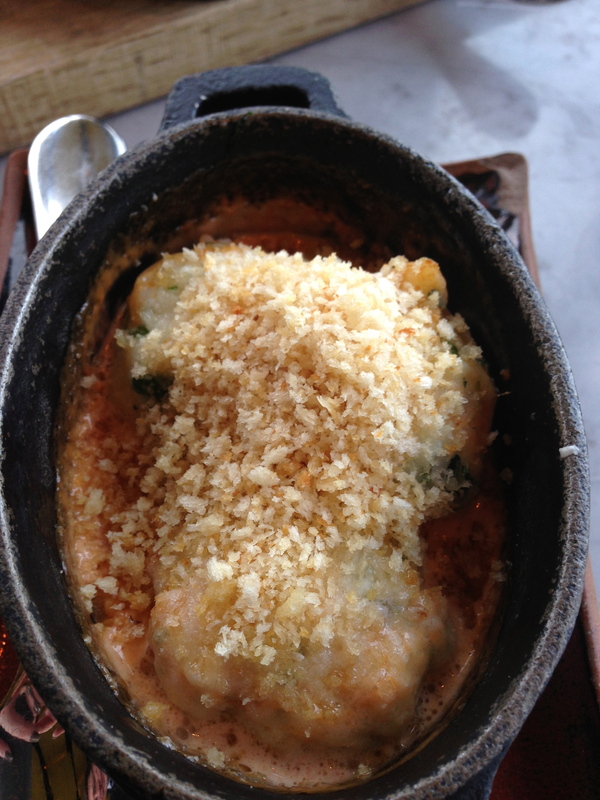 And then pollock dumplings with lobster cream, covered with breadcrumbs and Parmesan. This dish got most of the ooohs and aaahs of the night. Delicate yet flavoursome, we hoovered them down. 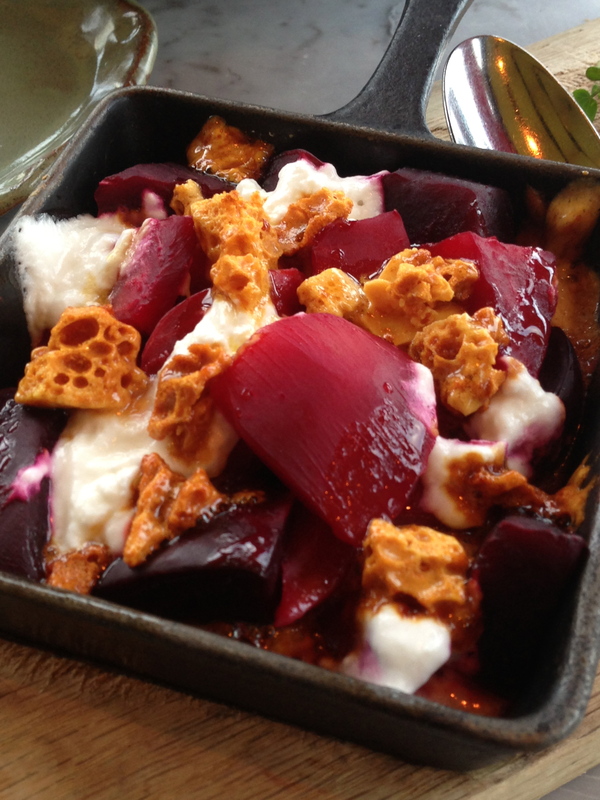 A roast Essex beetroot and goat’s cheese salad with honeycomb didn’t quite do it for me – steamed beetroot and the inside of a Crunchie isn’t a combination that I would have gone for – too much sweet – on – sweet. But really, if you’re going to go to a restaurant called Duck & Waffle, you really have to have that don’t you? It is, indeed, exactly what it says on the tin. Half a waffle, a quarter crispy duck, a fried egg on top of the duck, and a pouring jar of mustard maple syrup. I expected to find it a little meh, a little bit gimmicky, perhaps, but I found that I liked it. Really liked it, actually. And when you look at the component parts, what’s not to like? Think of the flavours in crispy duck and pancakes at your local Chinese restaurant. That. Without the spring onions and cucumber. M thought that it would benefit from the addition of those accompaniments, but I’m not sure, with the egg. It’s worth a try. She’s usually right. 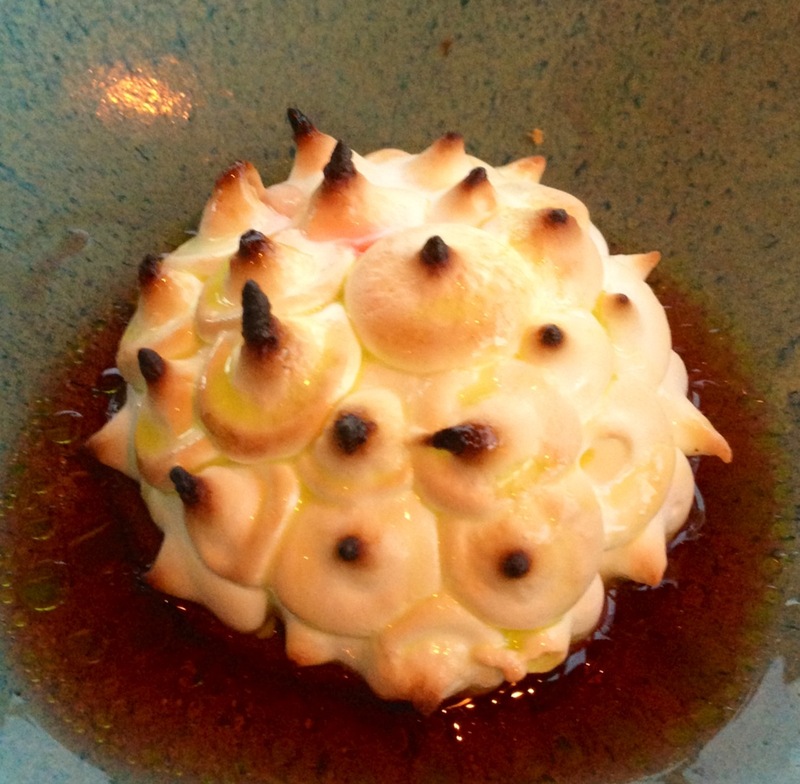 And because there seemed to be quite a large food gap in B’s culinary history, we insisted that he ordered the Baked Alaska. The fount of all food knowledge told us that it was invented in Delmonico’s in New York. And I thought it was 70s retro. The shame. It came looking like a marshmallow porcupine, surrounded by mint oil. Light, refreshing, with a good combination of flavours it was both witty, pretty and tasty. And M and I shared the chocolate brownie sundae, because we really needed. By now, the music was starting to get a little overpowering and we’d seen the sunset and it was time to go. We’d had a lovely evening but the atmosphere was not what I would call relaxing. It’s fun, it’s buzzy and if all else fails you have that spectacular view to fall back on. It’s the perfect place for a blind date. Any longuers, look out of the window and name the landmarks. I looked down from the restaurant and could see a party going on in the restaurant below, SushiSamba. Apparently a reward for people who had excelled themselves on Trip Advisor. That won’t be me then. There is an outdoor balcony at that restaurant, which you can reach from this one as they are connected. I’m not sure that alcohol and an outdoor balcony at thirty-nine floors up is a particularly good combination for me, so I’ll give it a miss.